Introducing Kmachine, a Docker machine fork for Kubernetes. Docker machine is a great tool to easily start a Docker host on most public Cloud providers out there. Very handy as a replacement to Vagrant if all you want is a Docker host in the Cloud. It automatically installs the Docker daemon and sets up the TLS authentication so that you can communicate with it using your local Docker client. 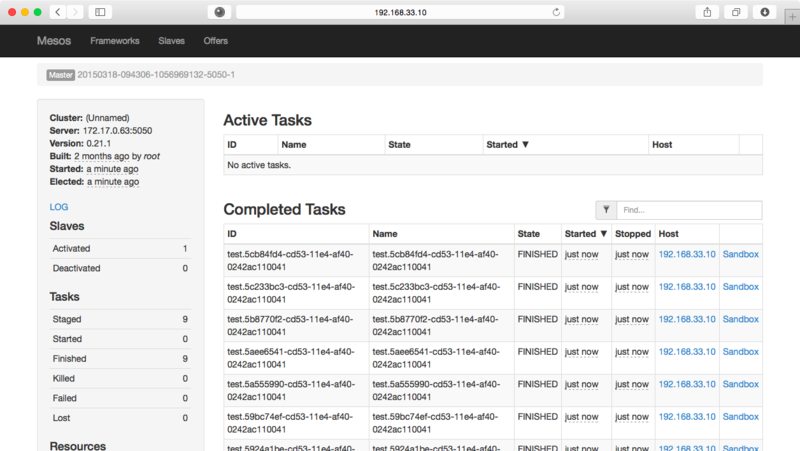 It also has some early features to start a Swarm cluster (i.e Multiple Docker hosts). I thought, let's hack Docker machine a bit so that in addition to installing the docker daemon it also pulls a few images and starts a few containers on boot. # eval "$(kmachine_darwin-amd64 env foobar5)"
You see that I used kubectl, the Kubernetes client to automatically setup the endpoint created by machine. The only gotcha right now is that I hard coded the token...Easily fixed by a friendly PR. We could also setup proper certificates and TLS authentication. But I opted for the easy route for now. If you setup your env. You will have access to Kubernetes, and Docker of course, the original docker-machine functionality is not broken. $ eval "$(kmachine env foobar)"
Since all Kubernetes components are started as containers, you will see all of them running from the start. etcd, the kubelet, the controller, proxy etc. Have fun ! I think it is very handy to get started with Kubernetes and still have the Docker machine setup working. You get the benefit of both, easy provisioning of a Docker host in the Cloud and a fully working Kubernetes setup to experience with. If we could couple it with Weave of Flannel, we could setup a full Kubernetes cluster in the Cloud, just like Swarm. 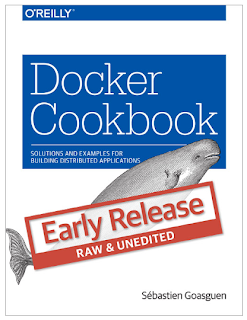 Docker makes building distributed applications relatively painless. At the very least deploying existing distributed systems/framework is made easier since you only need to launch containers. Docker hub is full of MongoDB, Elasticsearch, Cassandra images etc ... Assuming that you like what is inside those images, you can just grab them and run a container and you are done. With a cluster manager/container orchestration system like Kubernetes, running clustered version of these systems where you need to operate multiple containers and multiple nodes is also made dead simple. Swear to God, it is ! Just check the list of examples and you will find everything that is needed to run a Redis, a Spark, a Storm, an Hazelcast even a Glusterfs cluster. Discovery of all the nodes can be a challenge but with things like Etcd, Consul, registrator, service discovery has never been easier. What caught my eye in the list of Kubernetes examples is the ability to run an Apache Cassandra cluster. Yes, a Cassandra cluster based on Docker containers. It caught my eye especially that my buddies at exoscale have written an S3 compatible object store that uses Cassandra for storage. It's called Pithos and for those interested is written in Clojure. 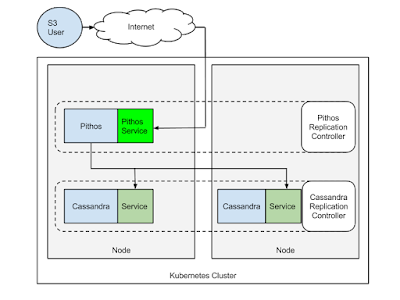 So I wondered, let's run Cassandra in Kubernetes, then let's create a Docker image for Pithos and run it in Kubernetes as well. That should give me a S3 compatible object store, built using Docker containers. Once the image is downloaded you will have your Kubernetes pods in running state. Note that the image currently used comes from the Google registry. That's because this image contains a Discovery class specified in the Cassandra configuration. You could use the Cassandra image from Docker hub but would have to put that Java class in there to allow all cassandra nodes to discover each other. As I said, almost painless ! $ kubectl get pods --selector="name=cassandra"
Note that you can also access the logs of a container in a pod with kubectl logs very handy. Pithos is a daemon which "provides an S3 compatible frontend to a cassandra cluster". 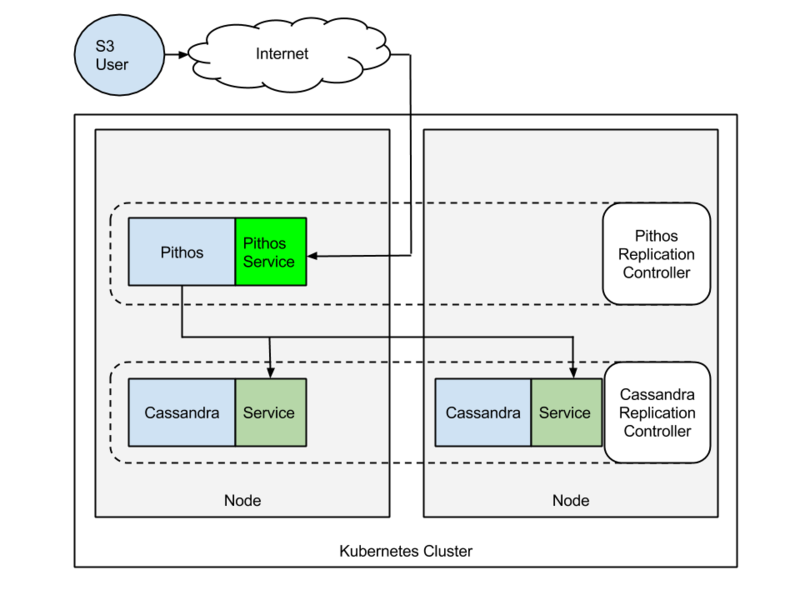 So if we run Pithos in our Kubernetes cluster and point it to our running Cassandra cluster we can expose an S3 compatible interface. Wait for the bootstrap to happen, i.e for the Pod to get in succeed state. Then launch the replication controller. For now we will launch only one replicas. Using an rc makes it easy to attach a service and expose it via a Public IP address. $ ./kubectl get services --selector="name=pithos"
Since Pithos will serve on port 8080 by default, make sure that you open the firewall for public IP of the load-balancer. You are now ready to use your S3 object store, offered by Pithos, backed by Cassandra, running on Kubernetes using Docker. Wow...a mouth full !!! And that's it. All of these steps make sound like a lot, but honestly it has never been that easy to run an S3 object store. Docker and Kubernetes truly make running distributed applications a breeze. Couple weeks ago Google finally published a technical paper describing Borg, their cluster management system that they built over the last ten years or more and that runs all Google services. There are several interesting concepts in the paper, one of them of course being that they run everything in containers. Whether they use Docker or not is unknown. Some parts of their workloads probably still use LMCTFY, - Let Me Contain That For You-. What struck me is that they say to not be using full virtualization. It makes sense in terms of timeline, considering that Borg started before the advent of hardware virtualization. However, their Google Compute Engine offers VM as a Service, so it is fair to wonder how they are running their VMs. This reminded me of John Wilkes talk at MesosCon 2014. He discussed scheduling in Borg (without mentioning it) and at 23 minutes in his talk, mentions that they run VMs in containers. Running VM in containers does make sense when you think in terms of a cluster management system that deals with multiple type of workloads. You treat your IaaS (e.g GCE) as a workload, and contain it so that you can pack all your servers and maximize utilization. It also allows you to run some workloads on bare-metal for performance. Therefore let's assume that GCE is just another workload for Google and that it runs through Borg. "How can we run VMs in Kubernetes ?" This is where Rancher comes to our help to help us prototype a little some-some. Two weeks ago, Rancher announced RancherVM, basically a startup script that creates KVM VMs inside Docker containers (not really doing it justice calling it a script...). It is available on GitHub and super easy to try. I will spare you the details and tell you to go to GitHub instead. The result is that you can build a Docker image that contains a KVM qcow image, and that running the container starts the VM with the proper networking. With a Docker image now handy to run a KVM instance in it, using Kubernetes to start this container is straightforward. Create a Pod that launches this container. The only caveat is that the Docker host(s) that you use and that form your Kubernetes cluster need to have KVM installed and that your containers will need to have some level of privileges to access the KVM devices. While this can be tweaked with Docker run parameters like --device and --cap-add, you can brute force it in a very unsecure manner with --privilege. However Kubernetes does not accept to run privileged containers by default (rightfully so). Therefore you need to start you Kubernetes cluster (i.e API server and Kubelet with the --allow_privilege=true option). If you are new to Kubernetes, check out my previous post where I show you how to start a one node Kubernetes "cluster" with Docker compose. The only modification that I did from that post, is that I am running this on a Docker host that also has KVM installed, that the compose manifest specifies --allow_pivileged=true in the kubelet startup command, and that I modify the /etc/kubernetes/manifests/master.json by specifiying a volume. This allows me not to tamper with the images from Google. Starting one of those will give you access to a KVM instance running in the container. I will skip the startup of the Kubernetes components. Check my previous post. Once you have Kubernetes running you can list the pods (i.e group of containers/volumes). You will see that the Kubernetes master itself is running as a Pod. The RancherVM image specified contains RancherOS. The container will start automatically but of course the actual VM will take couple more seconds to start. Once it's up, you can ping it and you can ssh to the VM instance. PING 172.17.0.10 (172.17.0.10) 56(84) bytes of data. Remember that a Pod is not a single container but could contain several ones as well as volumes. Let's go a step further, and scale the number of VMs by using a replication controller. Kubernetes is quite nice, it builds on years of experience with fault-tolerance at Google and provides mechanism for keeping your services up, scaling them and rolling new versions. The replication Controller is a primitive to manage the scale of your services. If you list the pods, you will see that your container is running and hence your VM will start shortly. Now of course, this little test is done on one node. But if you had a real Kubernetes cluster, it would schedule these pods on available nodes. From a networking standpoint, RancherVM can provide DHCP service or not. That means that you could let Kubernetes assign the IP to the Pod and the VMs would be networked over the overlay in place. Now imagine that we had security groups via an OVS switch on all nodes in the cluster...we could have multi-tenancy with network isolation and full VM isolation. While being able to run workloads in "traditional" containers. This has some significant impact on the current IaaS space, and even Mesos itself. Your Cloud as a containerized distributed workload, anyone ??? 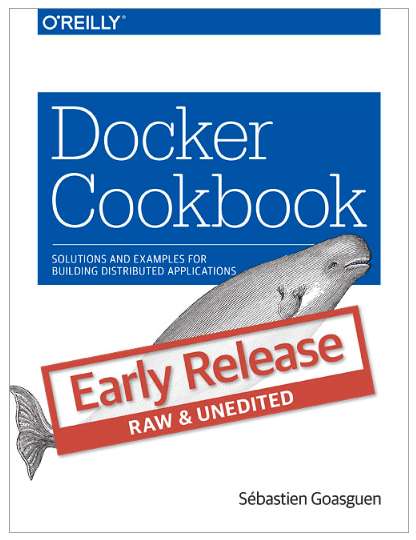 For more recipes like these, checkout the Docker cookbook. After 1 command to Mesos, here is 1 command to Kubernetes. What I find very interesting with Kubernetes is the concept of replication controllers. Not only can you schedule groups of colocated containers together in a cluster, but you can also define replica sets. Say you have a container you want to scale up or down, you can define a replica controller and use it to resize the number of containers running. It is great for scaling when the load dictates it, but it is also great when you want to replace a container with a new image. Kubernetes also exposes a concept of services basically a way to expose a container application to all the hosts in your cluster as if it were running locally. Think the ambassador pattern of the early Docker days but on steroid. All that said, you want to try Kubernetes. I know you do. So here is 1 command to try it out. We are going to use docker-compose like we did with Mesos and thanks to this how-to which seems to have landed 3 days ago, we are going to run Kubernetes on a single host with containers. That means that all the Kubernetes components (the "agent", the "master" and various controllers) will run in containers. In the YAML file above, you see in the commands that it used a single binary hyperkube that allows you to start all the kubernetes components, the API server, the replication controller etc ... One of the components it started is the kubelet which is normally used to monitor containers on one of the host in your cluster and make sure they stay up. Here by passing the /etc/kubernetes/manifests it helped us start the other components of kubernetes defined in that manifest. Clever ! Note also that the containers where started with a host networking. So these containers have the network stack of the host, you will not see an interface on the docker bridge. That's a simple example, where you can actually start a single container. You will want to group your containers that need to be colocated and write a POD description in YAML or json than pass that to kubectl. But it looks like they extended kubectl to take single container start up. That's handy for testing. You can have some fun with the resize capability right away and see a new container pop-up. Now take your browser and open it at http://192.168.33.10 (if that's the IP of your host of course) and enjoy a replicated nginx managed by Kubernetes deployed in 1 command. You will get more of that good stuff in my book, if I manage to finish it. Wish me luck. CloudStack comes with a simulator. It is very handy for testing purposes, we use it to run our smoke tests on TravisCI for each commit to the code base. However if you want to run the simulator, you need to compile from source using some special maven profiles. That requires you to check out the code and setup your working environment with the dependencies for a successfull CloudStack build. With Docker you can skip all of that and simply download the cloudstack/simulator image from the Docker Hub. Start a container from that image and expose port 8080 where the dashboard is being served. Once the container is running, you can use docker exec to configure a simulated data center. This will allow you to start fake virtual machines, create security groups and so on. 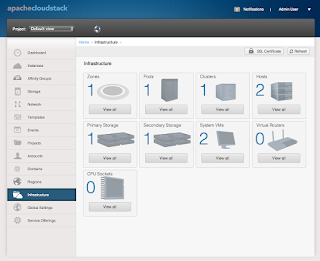 You can do all of this through the dashboard or using the CloudStack API. The image is a bit big and we need to work on slimming it down but once the image is pulled, starting the container will be almost instant. If you feel like sending a little PR just the Dockerfile, there might be a few obvious things to slim down the image. Enjoy the CloudStack simulator brought to you by Docker. When compose was released, I tried it and was a bit underwhelmed, as it is basically a relooking of Fig. This is not unexpected as Docker Inc, acquired Orchard the makers of Fig. But I was expecting more added functionality and even a tighter integration with the Docker client (something a dev branch actually prototyped), even a common release instead of a separate binary. I am sure this will come. Someone at Rancher must have some cattle in the middle of Arizona or in the backcountry of California. Or one of their VCs might be in Montana sitting in a big ranch while Docker is eating the IT world. In any case, this post is short and sweet like veggies and not like cattle (TFW) and is about Rancher and the newly announced RancherOS. Check out the rancheros announcement. Let's keep this short, shall we ? Docker is great, but it is a daemon running on a single host. Since you want to scale :) and operate multiple servers, you need something to manage your Docker containers across multiple hosts. Several solutions are emerging, of course Docker Swarm but also Kubernetes, Lattice from Cloudfoundry and even Apache Mesos. Rancher is one of these cluster management solutions for Docker. It does some nice things like cross-hosts container linking through a custom built network overlay (think Flannel, Weave, Socketplane). You can use Rancher with any set of Docker hosts. However, a new type of operating systems have started to appear. Container optimized OS. Or Just Enough Operating System for Docker. CoreOS, ProjectAtomic from RedHat, Ubuntu Snappy fit in that space. They aim to provide rolling atomic upgrades to the OS and run everything in it as a container. No more package manager, magic happens and you are always up to date. Package all your apps in containers, and use Rancher to run them in your cluster. End of story. Wait, enters rancherOS. rancherOS is a super minimalistic OS exclusively for Docker. It goes further and also runs system services as container themselves. And I will let @ibuildthecloud talk about systemd and Docker as PID 1. The next logical question is of course....drum roll... Can I run rancher on rancheros. RinR not R&R ? And the answer is a resounding yes. I expect Rancher to come out in the next weeks maybe months with a solid product based on the two. Once all the workers have registered you can use the UI or the API to start containers. In this very early super bleeding-edge testing phase (as you can tell in my good spirit today), I did find a few things that were a bit strange. Considering rancherOS was announced just last week, I am sure things will get fixed. Cloud-init support is minimal, not able to add second network interface, support for both keypair and userdata at the same time seems off. The UI was a bit slow to start and building the overlay was also a bit slow. It is also possible that I did something wrong. Overall though, rancher is quite nice. It builds on years of experience in the team with developing CloudStack and operating clouds at scale and applies it to the Docker world. It does seem that they want to integrate with and provide the native Docker API, this would mean that users will be able to use Docker machine to add hosts to a rancher cluster, or even Docker swarm and that launching a container would also be a docker command away. How that differentiates from Swarm itself is not yet clear, but I would bet we will see additional networking and integration services in Rancher. Blurring the lines with Kubernetes ? Time will tell.